07-06-2012: MINNESOTA This day featured a Slight Risk, stretching from eastern SD through central MN into northern WI. There was a 5% tornado risk along a stalled front through central MN, roughly from Benson to North Branch, MN. The setup included this front that actually sagged south to near the Hwy 12 corridor by the afternoon and then southwest towards Marshall to a surface low across southeast SD by the afternoon. In the upper levels, there was generally weak support over central/southern MN as the higher bulk shear and jet level winds were displaced well to the north of the boundary across northern MN into Ontario. A weak shortwave was expected to give a glancing blow to the area along the front and ignite severe thunderstorms across the area by mid to late afternoon. I left work at 2:30pm and met Wes Hyduke at my place and we chose to head northwest towards the Dassel area to target initiation. As we headed west towards Dassel, we noticed a CU field growing directly ahead of us where two boundaries appeared to be coming together. Between 3:45 and 4:45pm, this CU field grew in size and became better defined as the boundary began to move southeast towards the Twin Cities. We progressed southeast through Winsted and New Germany, following what was becoming towering CU in an environment characterized by 3000-4000 j/kg of MLCAPE and rich boundary layer moisture of low 70s dewpoints. Storms were having a difficult time getting going due to the capped air of 21-24C 850 temps and 12-14C 700 mb temps. 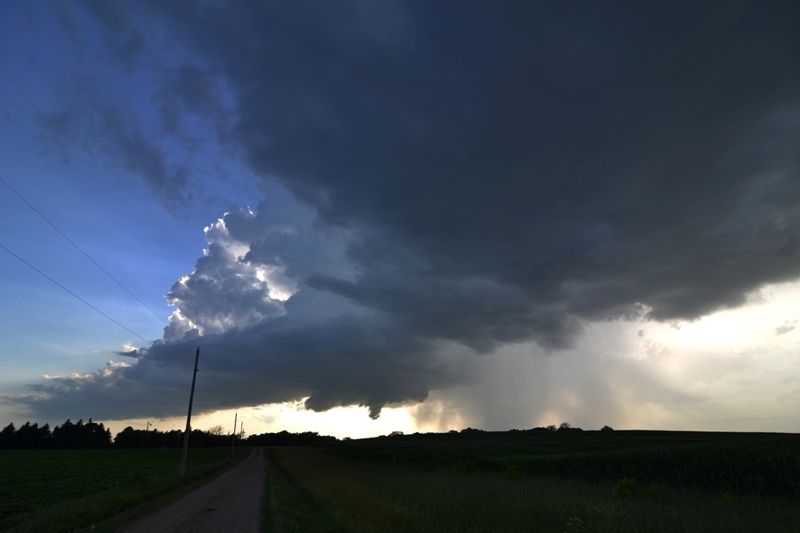 However, one storm broke through around 6pm near Fairfax, right as a mesoscale discussion was issued that highlighted the risk for severe thunderstorms with damaging winds and large hail in central MN. 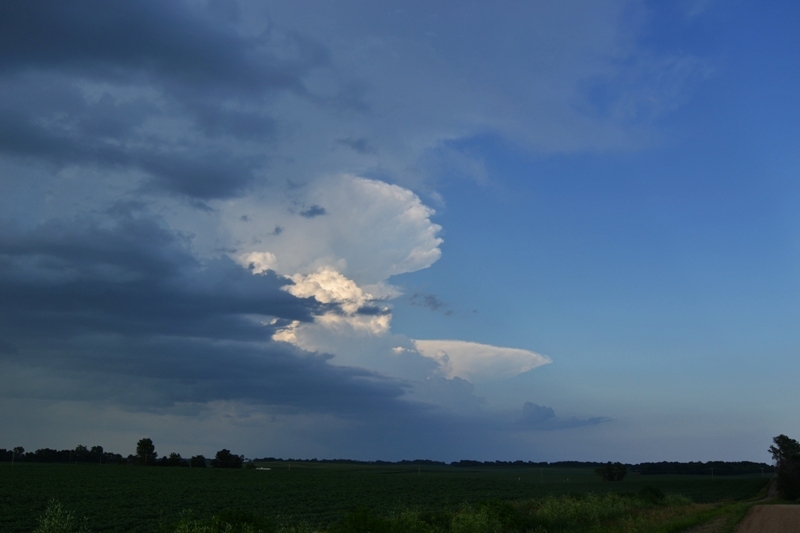 Between 6-7pm, additional storms fired on the boundary over the Twin Cities and northeast, while we chose to target the southwest storm approaching New Auburn. We ended up traveling south on Cty Rd 33/5 to near the Assumption State Wildlife Management Area where we intercepted the storm. At 6:40pm, a Severe Thunderstorm Watch was issued for areas from south-central MN through the Twin Cities and into northwest WI. The storm became better organized northeast of Green Isle and was one of the few storms that did not yet get undercut by the southeast moving front. All storms north of the boundary that were not rooted were quickly weakening and dying, but our storm was still locked on the boundary. 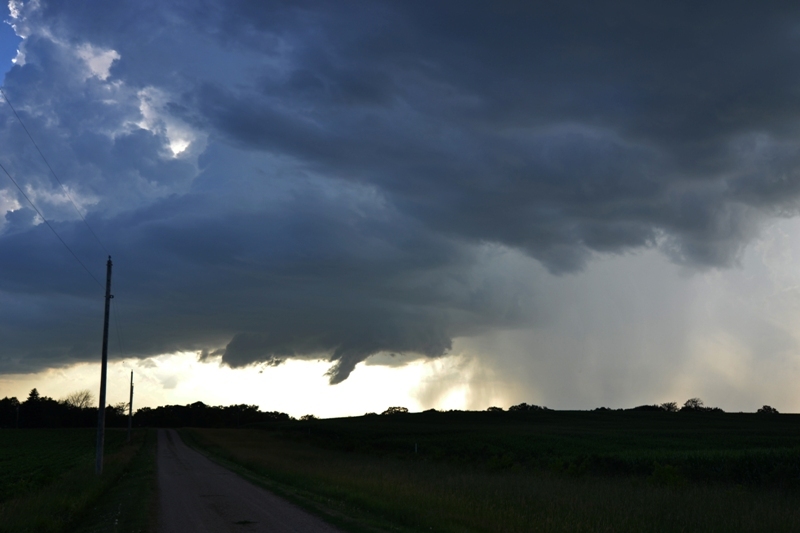 In the vicinity of 7:15-7:30pm, the storm did produce a slowly rotating wall cloud and what looked to be a brief funnel as the boundary came through and quickly undercut the storm. It was surprising that it did this much because the surface winds were very weak and sometimes non-existent, but the storm seemed to have some sort of lower mid-level inflow as noted by the condensating inflow tail. The wall cloud did not last long and the storm had pretty good structure for only a short while before completely dying upon moving north of the boundary. A pair of severe warned storms along the front to our northeast, over the Twin Cities metro. 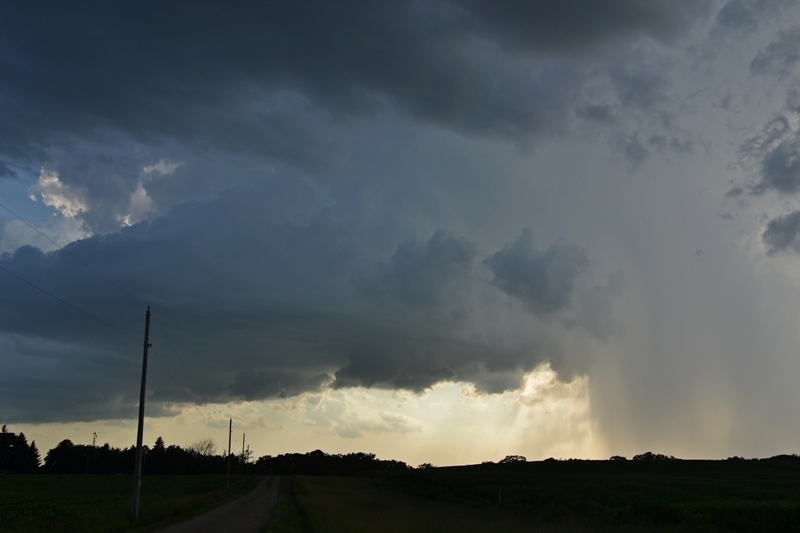 Lowering on a storm to our northwest near Hamburg, MN. 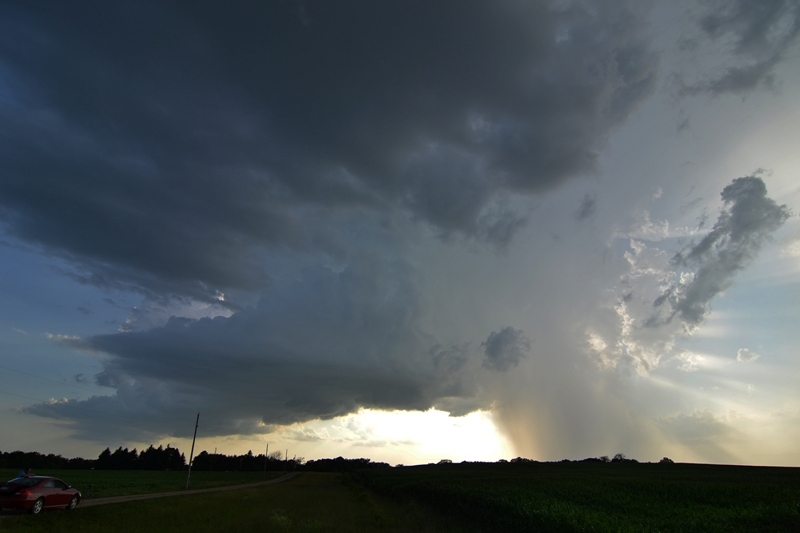 Beautiful storm with wall cloud underneath and inflow tail cloud into it. New updraft on the southwest flank. Closer view of the wall cloud and inflow tail with rain core on the north side. Towards the tail end of where I think there may have been a short-lived funnel on the left side of the wall cloud. This feature is shown better in the video. 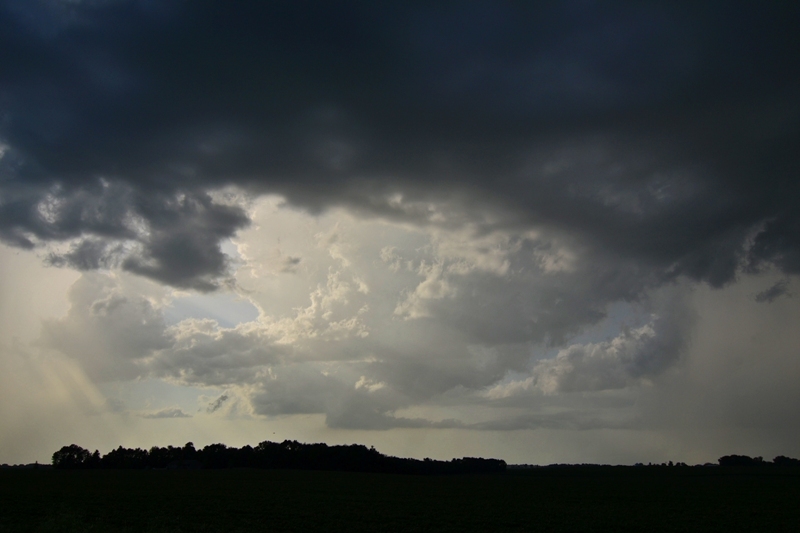 Watching the backlit storm as it began meeting its demise east of Green Isle, MN.